This site is part of the EmployeeTimeClocks.com Internet family of sites. Detex is the authority for watchman clocks and guard tour verification. Watchman clocks or watchclocks are made from the most rugged of materials and are built with security in mind. Search this site for more information about Detex watchman clocks such as the Detex Newman, Detex Guardsman, and the Detex Proxipen kit. These Detex products can also be purchased online or by telephone. The Guardsman, unlike most watchclocks, provides an uninterrupted record of a watchman's activities for up to 120 hours. For your company, its extended time-keeping capacity translates into total control and accountability for weekends, holidays and plant closings, as well as routine overnight patrols. The advancement of the tape is synchronized with the clock mechanism so that consecutive station registrations appear as an unbroken band of numbers; missed stations appear as conspicuous gaps. The Guardsman boasts rugged construction, including a die-cast aluminum housing, heat-treated crystal, and a riveted and reinforced case of harness leather. Buy these products online at EmployeeTimeClocks.com ! Detex introduces the latest innovation in guard tour verification technology: the new GCS ProxiPen Data Acquisition Unit and TopGuard reporting software. 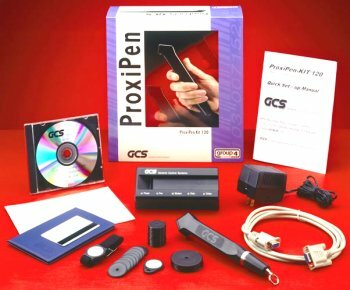 ProxiPen’s data points are Radio Frequency Identification (RFID) tags, which the ProxiPen senses and reads automatically whenever they come into its reading range. ProxiPen is compact, lightweight and easy to use since it has no external controls. Its electronics are sealed in a tough polycarbonate housing, making the reader completely waterproof and resistant to heat, shock and hydrocarbons. Also change your own AA battery! Browse the online catalog at EmployeeTimeClocks.com ! Detex Newman with an electronic Quartz movement. Lightweight, same functions, and same supplies as the standard Newman. This unit comes with a nylon bag and strap, and uses a AA battery. Our new battery-operated Newman Quartz watchclock delivers all the dependability you'd expect from a Newman, but with a reliable quartz movement. The Newman Quartz watchclock is lightweight and is built to withstand rugged use with a die-cast aluminum housing and a tough nylon case. Best of all, it never needs winding. Detex also makes parts and accessories available for their Watchman clocks and guard tour equipment. We have things like: OEM D-Tape Rolls for Guardsman, station boxes with key, Detex Mega-strip OEM, Proxipen RFID tags, surface type key boxes, Guardsman clock keys, and more. This small article addresses the following products: Morse Watchman, The Pipe, Amano PR600, Acroprint C72, Acroprint ARESIII, Star72, Detex Watch Clocks, Newman, Guardsman, WinDau, TopGuard, and TopGuard Plus watchman clock systems. Consider this: We wrote this article. You should do business with people who understand you needs, not just people who sell boxes, or anything to make a fast buck. We’ve been selling and assisting patrol guard companies for many years. We ask you about the application before offering the solution. If the product fits the need, then we all win. It’s harder to do it right, it’s easier to do it wrong. We prefer to do it right. Watchman clocks are becoming more and more prevalent in many businesses. They used to be found in mostly large gated communities, hospital security, parking garages, retirement homes, construction projects, condominiums, shopping malls, resorts, military bases, and government buildings. Now such Detex watchman clock systems are finding their way in to the hands of private security companies. Critical security places like retirement communities, malls, parking garages, hospitals, shipping ports, refineries, universities, libraries, car dealerships, parks, office complexes. gated communities, and more. When the property is at risk of being entered, then watchmen clocks are essential. How the mechanical clocks work: For the guard tour Stations for all Detex mechanical clocks, all the stations are interchangeable. To repeat: They are all the same. The same key stations work for all three styles. Newman, Newman Quartz, and Guardsman. You open each machine with one key, and wind it with another – or in the case of the Quartz, just change the battery twice a year. The Guardsman uses a roll tape – D Tape - also called item N24, The Newmans, both Detex Newman and Detex Newman Quartz, are less expensive, and use general time disks, part number 3924. They both have their applications. They show generally what time the control point was checked, not exactly, like the Guardsman (or the Amano PR600, for that matter). When a watch clock is opened, a circle is printed or a hole is punched in the tape at the time it is opened. You cannot beat the system. Other companies have competing products: The Amano PR600, PR600s, and PR500 – which is almost identical to the PR600 watchmen’s clock. These are much like the Benzing, and the N24 Guardsman. We also sell these – the Amano PR600 Kit. Decent machines, they come as a package with 15 stations and use similar report tapes. The Pipe and Acroprint make Watchmans kits as well. The Acroprint C72 Watchmans clocks is an inexpensive plastic device. The station keys are plastic, the reports are also dials, much like the Newman clocks. We prefer metal keys, as they simply hold up longer. The Amano PR600 and Detex clocks use only metal guard tour station keys. Guard Tour Software Systems: There are competitors, such as Morse Watchman, The Pipe, and a few other independents, but only two really do a good job, and only one does the best. A less expensive system is the Acroprint ARESIII system. See it on our web site. The ARES III uses I-button technology. It has a decent software package. Again, see our website for more information. The unit is fairly bulky, but you get a lot for the money. The Pipe is very expensive, but we hear that our Detex Proxi Pen with WinDau and TopGuard software is a better product. Remember, Detex is the oldest company in the business with by far the largest installed and running customer base. Detex is number one in the business because Detex is the best. Ask any Detex owner, they will nearly always buy Detex again and again. The Detex WinDau software has been updated, it is now called TopGuard, and TopGuard Enterprise. The TopGuard software is given away (free) when you purchase the Detex ProxiPen Kit. Separately, it is $395.00 It is feature-rich. Detex has been selling watchman systems since the 1800’s, so they have the most sensible guard tour software system on the market. Their service is second to none, and for now, the software comes with “lifetime support”. The ProxiPen works under water. It is not affected by the weather. The ProxiPen tags (stations) are RFID. You can paint over them; hide them under wallboard, and more. See the website for more information. Some of the best features found in the software guard tour clock systems are: Accountability. You can see which guard went to which tour station on which assigned tour. You can see if the guard actually hit the station, or if he missed it. There is a missed checkpoint report. There is a guard tour report by individual tour. You can even see an incident report. In the TopGuard – WinDau software, you get the basics, which is fine for 90% of all applications. With TopGuard Plus and Detex Enterprise software, you get to export to Excel, and make all kinds of custom reports. Reports by location, by tour, by incident, by individual guard, and more. It’s easy to see the ramifications of such data collection.